One of the best time to Railfan Amtrak’s Northeast Corridor or NEC,is the Sunday after thanksgiving.This Is due to the fact,that the Railroad has to borrow equipment from New Jersey Transit or NJT and Maryland Area Regional Commuter or MARC.On November-29th-2015,I headed down to Perryville Maryland To film some of the action. 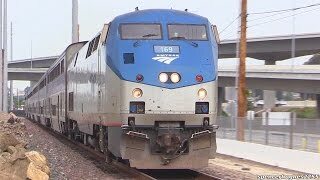 I was successful on this date, filming Both the Marc’s Bombarider Transportation HHP-8s and NJT’S Arrow 3 cars made appearances. 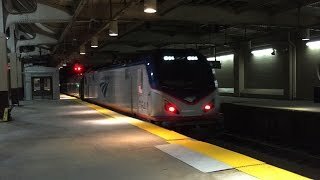 Amtrak put on a show of their own with the usual Acela’s,and ACS-64s.We also got 642 the Amtrak Veteran’s ACS-64 as well. Unfortunately We weren’t able to see any AEM-7s,but we also visited the CSX Philadelphia Subdivision or Philly sub and were able to film two eastbound CSX trains at a new spot for us.Jackson Station Road Bak 54.5 We started out the Morning at the Perryville Station.As a eastbound Acela rolled by. A CSX ES40DC and D8-40DC in YN2 was the power. Milepost 54.5 Jackson Station Ave. Though we never got to see 7604, we did catch a few of her sisters leading. Here are links to those videos. We Hope to go to Pam AM in 2019. We then headed back to Amtrak. At the time We Shot this Video.They have Since started to Rebuild them, our goal for 2019 is get them on Video. 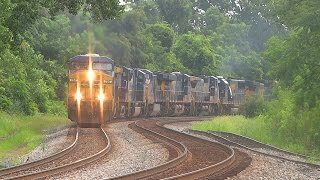 We then headed back to the Philly Sub to Film Q034-28 the northbound CSX Intermodal from Jacksonville FL which had a decent lashup,consisting of A ES40DC,AC4400CW in YN2 and a D8-40C. These cars were built in 1974 and will be in service until 2020 when their retirement is planned. And that was it, for our day trackside around Perryville. Special thanks to my mom for the Ride, Jeffrey Y for the info on the Q034-28 and to Steven Talarsky for the HU on the Arrow’s and Marc Set. 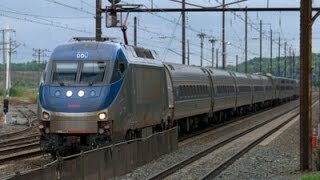 Link to Some Other Northeast Corridor Videos.